Aug. 1982 Research Associate in Biochemistry, The University of Chicago; (Dr. Ira.G. Wool). With the completion of human genome decoding, we are currently entering the "post-genome" era. Analysis of the function and structure of protein, which is a product of gene expression, has been taken up as the most crucial issue in life science, under the name of proteomix. This, in turn, is expected to lead to the creation of new life technologies, beginning with new drugs, aiming to control and apply protein functions. The original cell-free protein synthesis system that Yaeta Endo developed can meet these expectations. Conventional protein manufacturing technology includes methods of refining protein directly from live materials and, in recent years, cell biochemical methods in which genes are introduced to living cells from coli bacteria, yeast and the like, whereupon the protein biosynthesized from that DNA is refined and isolated. In all such cases, however, various problems exist in terms of the volume and quality of the protein obtained and the costs involved. Moreover, the use of live cells raises bioethical issues. Based on the knowledge that he has accrued from many years of serious, basic research on the ribosome, which can be called a protein synthesis "factory," Mr. Endo strove to establish a cell-free protein synthesis system and succeeded in developing epoch-making technology. In other words, he elucidated, biochemically, the phenomenon of instability that was considered to be inevitable in proteins generated using the conventional live materials; based on his results, he succeeded in controlling this phenomenon by focusing on wheat germ, a plant material. By adopting wheat germ for this process, Mr. Endo succeeded in efficiently forming -- in a test tube, using DNA without cells - protein of quantities and diversities far superior to those obtained with the conventional methods. Mr. Endo can thus be said to have established the world's first practical method for synthesizing protein in test tubes using DNA. In addition to the fact that this technology does not utilize life forms, as the DNA that serves as the starting material can be automatically synthesized as desired at present, the technology developed by Mr. Endo has made it possible to synthesize new types of protein not found in nature. This will greatly expand the conventional range of types of protein molecules beyond existing life forms. In fact, it may be said that Mr. Endo has made the creation of artificial proteins possible. We can thus expect that this achievement will open up major possibilities not only in the fields of life science and life technology but in every basic field of science and materials -- as well as measurement science, technology and industry -- in the twenty-first century. Worthy of special mention is the fact that this research and technology was engaged in solely by Mr. Endo and his team. 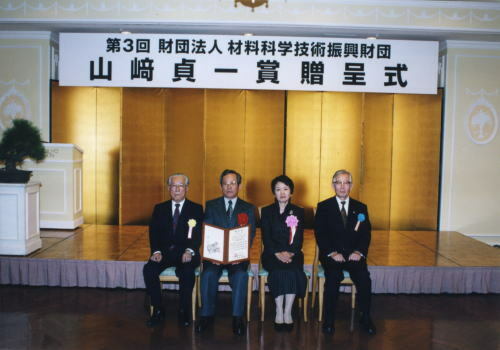 As well as being an original biotechnology that Japan can contribute to the world, it is also a technology that will spread extensively to basic and application research and is thus worthy of the Teiichi Yamazaki Prize.